The Hidden Garden's Amy Child Marella shares her expert floral advice. Trees have long been a symbol of love and romance. Their twisting roots, elegant branches, and picturesque leaves add warmth, color, texture, and whimsy to any wedding décor. Trees and flowers complement each other in nature, so it is no surprise that they also make a wonderful pairing for weddings. Trees are perfect for every season, couple, and wedding theme, so whether your dream décor is rustic or romantic, there is a type of tree perfectly suited to your taste. INTEGRATION OPTIONS Trees have beauty, strength, and roots. All of these are qualities that you also find in a healthy marriage, so it is fitting that more and more brides are choosing to incorporate trees into their wedding décor. The Ceremony. A wedding aisle lined with trees is a beautiful sight (indoors or out), and the look is going to become all the more popular courtesy of the royal wedding of Prince William and Catherine Middleton at London's Westminster Abby. Potted trees can be strung with garlands of flowers, draped in tulle and tied with ribbon, or left unadorned for a fresh, natural look. Strings of tiny lights entwined in branches lend a magical effect to trees during an evening ceremony. The Cocktail Hour. 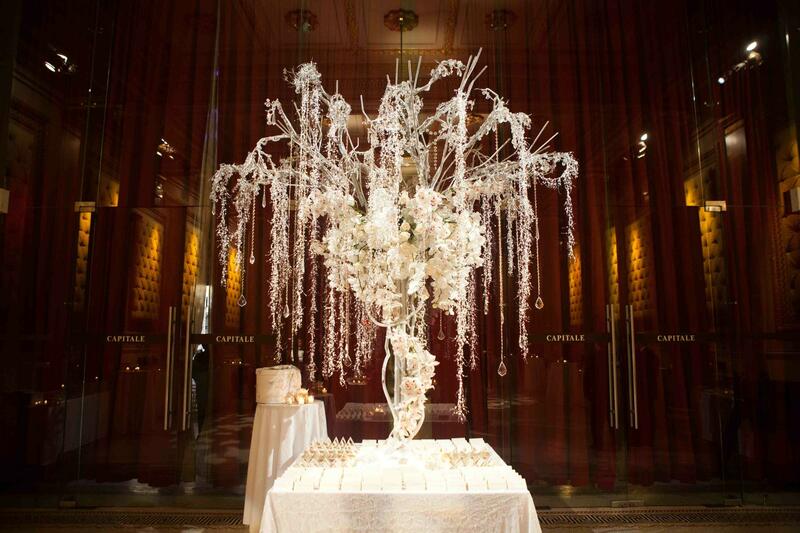 Displaying a tree during the cocktail hour that is strung with seating cards for the reception is an extremely fashionable choice for brides. If your cocktail hour is outdoors, and a tree is on the property, cards can be fastened to long lengths of ribbon that are then attached to branches. If your cocktail space lacks a planted tree, or your event takes place indoors, a tabletop "tree" can be fashioned of branches and serve the same purpose as a live or potted tree on a smaller scale. The Reception. Live trees in a reception space are not only beautiful, but also purposeful. Placing large trees in the corners of the room make the space appear smaller. This is ideal if you happen to be in a room that holds 400, but only have 250 guests in attendance. The natural element that live trees introduce to a design does so much to create intimacy and soften a space that might otherwise seem cold. SEASONAL OPTIONS Whether you're planning your nuptials for winter, spring, summer, or fall, there's a style of tree décor to enhance the beauty of your wedding. Summer. Custom-built "trees" utilizing attractive branches of magnolia or weeping pepper are two of my favorites for the balmy summer months. Both are oversized trees that are great for stage use or anchoring corners of the room. A custom-built magnolia or pepper tree begins with a stock base that is 6-10 feet high. The fresh-cut branches of magnolia or pepper are mounted to the stock base, and the finished product is a 16-foot, stately tree for the inside of the ballroom. Fall. For a fall affair there must be foliage. Liquidambar (also known as "sweet gum") trees are perfect colorful accent to the room with their display of orange, rust, and golden tips. If the fall leaves have already turned or dropped by the time of your wedding, faux leaves can always be utilized to build branches. Winter. A lot of couples getting married in the colder months select a "Winter Wonderland" theme. White and delicate, birch branch tie in beautifully to this look. Incorporating birch twigs into wedding centerpieces makes for a striking display. Additionally, a few faux, frosted branches evoke the feeling of freshly fallen snow. Spring. Brides go crazy for blossoming trees this time of year. Trees with ethereal blossoms are a breathtaking sight that lend themselves to the freshness of the season. Often times florists use faux blossoms on trees that mimic natural blooms. Once the lights are dimmed and the uprights are on, your guests will be transfixed with the splendor of these trees and never know the difference. Cherry, plum, apple, and dogwood trees produce beautiful fresh blossoms. With all of this beauty comes a financial investment. If you are renting the trees as opposed to purchasing them, costs for delivery and pick-up will be added to the rental fee. Unless you decide to buy and have the trees replanted on your property after the wedding. I recommend rentals as the way to go. The beauty and majesty of the trees is well worth it.